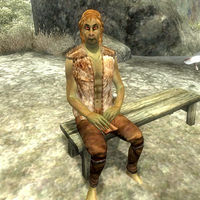 Ralsa Nethan is a Dunmer priest who is a devout worshipper of the Daedric prince Azura, and can be found with his fellow worshippers Mels Maryon and Bur-Meema at the Shrine of Azura. He wears a huntsman vest with a pair of huntsman leather pants. He also carries a small amount of gold and an iron dagger as well. Ralsa has the ability to use a leveled set of priest spells and one extra major Restoration spell. He has no notable involvement in the Azura's Shrine Quest. Though his conversation options and responses change as you go through the quest. If you have not started Azura's quest he will tell you "This place is sacred. Please respect our privacy." and end his conversation with you. Like his fellow worshippers he will spend all the time wandering about the shrine. He never sleeps, instead dedicating every moment of his existence to worship of Azura. Several citizens of Cheydinhal will mention Ralsa and his fellow worshippers, and defend their right to worship a Daedric Prince. Trayvond the Redguard will say: "Daedra cults aren't necessarily evil, of course. In nearby Morrowind, for example, they worship Daedra in the Temple. The Azura shrine north of town, up Lake Arrius way, for instance. I know a Dark Elf there. Nothing evil about him." Ulene Hlervu, an open critic of any kind of worship, will comment: "The Azura coven in the Jeralls north of Cheydinhal... nice folks. Nothing like the blood-drinking Daedra worshippers everyone raves about. A waste of time, of course, worshipping gods in the first place. But at least they're not raving lunatics." This page was last modified on 15 November 2018, at 20:36.